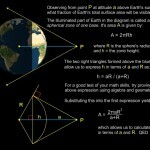 Answer: I have a formula for calculating the amount of Earth’s surface visible, given the observer’s altitude. It necessarily assumes you have a clear view of the horizon in all directions, unblocked by buildings or mountains. That’s pretty much the case when you’re flying at high altitude, less so if you’re just on the roof of a tall building. Poe was asserting that Hans Phaall, from the lofty altitude of 25 miles, could see 1/320 of the Earth’s total surface area. When I read a claim like that in a science fiction story, I sometimes check its accuracy just to see if the author took the time to get it right. Occasionally I find errors. So I used that visibility formula to check Poe’s numbers. 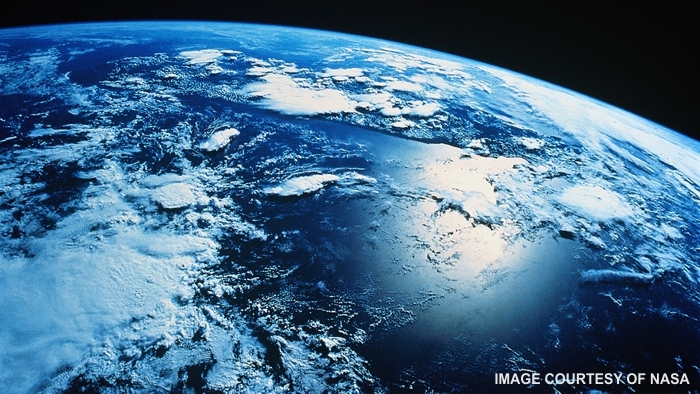 We know the total surface area of the Earth is 510 million km2 (197 million square miles). Its radius is 6.371 × 106 m (4000 miles). The rest is geometry and algebra. Poe got it right to within 2%. If you trust me on the math, skip to the chart. If you want to see the geometry, click on the thumbnail below. Likewise, from at ground level (AGL), the average person sees only one 6.5-millionth of the entire surface, but on the International Space Station, astronauts enjoy a view of one 40th of the planet. And I’ve saved you some math by including your airline experience in the fourth row. You were seeing a little over a thousandth of the planet. I like the note! Can the folks at McMurdo Sound get signals from the geosynchronous satellite? By “note” I assume you mean the thumbnail? Just for symmetry, I showed point P at an altitude of 1 Earth radius. 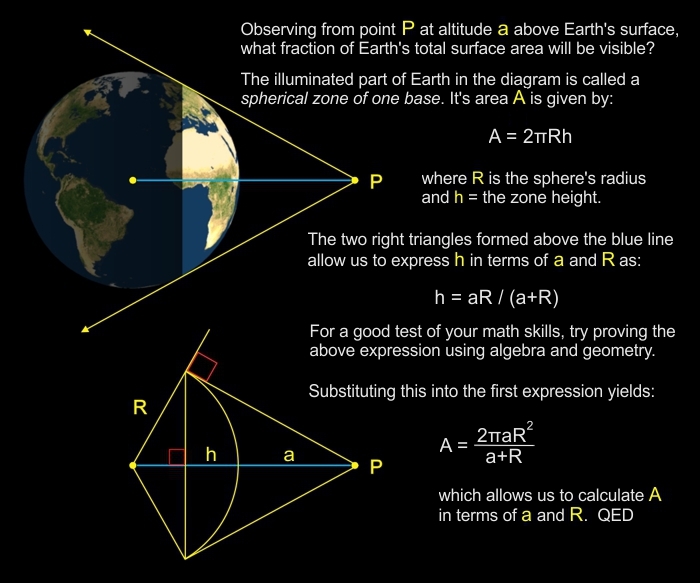 Geosynchronous satellites are at an altitude of 5.6 Earth radii, and that would wreak havoc on the diagram scale. But to answer your question, at 77° S latitude, sure, McMurdo Sound can “see” geosynchronous satellites. I believe that’s how they get internet at McMurdo Station (citation needed). When I visited Barrow, Alaska (71° N latitude) I saw a lot of satellite dishes, all aimed nearly horizontally. But I’m guessing signal dropouts are more common at those low aiming angles.